Drive and achieve the ambition of inspiring a generation of communicators, creatives, brand and business-builders. Equip them with information and inspiration to pursue their goals through a well-curated conference and festival. The adobo Festival of Ideas will be packaged and promoted as a world-class event, comparable to those held in the region like Spikes Asia, Festival of Media and Rise. 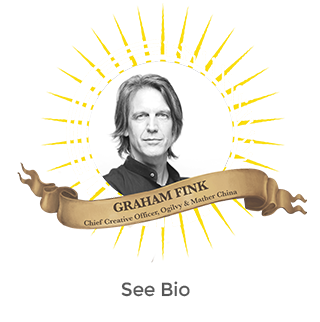 Graham joined Ogilvy & Mather (O&M) China in 2011 as Chief Creative Officer, overseeing 20 offices. The following year, he won Ogilvy Asia’s very first Grand Prix at Cannes for Coca-Cola’s #CokeHands. With over 20 years experience, Graham has worked across seven different agencies – including Saatchi & Saatchi London where he created the iconic British Airways ‘FACE’ commercial with Hugh Hudson and a cast of 6,000. During his six years as Executive Creative Director at M&C Saatchi in London, the agency won the most creative awards in its 15-year history. Kazuhiro Shimura is revolutionizing the creative field as a new type of creative professional. With a background in biotechnology, he started his career at Dentsu. He successfully developed new client businesses and services, using technology and data, besides creating great ads. His strengths are his abilities to bring innovation to advertising, business design, and even product services based on creative ideas. He works with the Toyota Future Mobility Development Division, of which he has been a member of, to develop the “i-ROAD”, the three-wheeled electric vehicle and its mobility related services with Toyota. 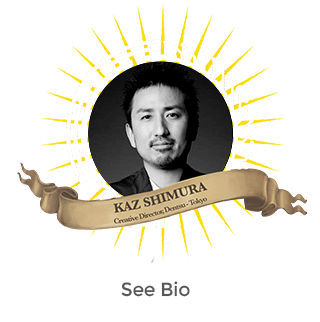 As Creative Director, Kazuhiro has received numerous international awards including Cannes Lions, One Show, Clio, D&AD, LIA, on top of Grand Prix at Spikes Asia and Adfest. Torie leads the region of South East Asia & India for Omnicom Media Group, the global media and communications network, with brands that include OMD, PHD and Hearts & Science. 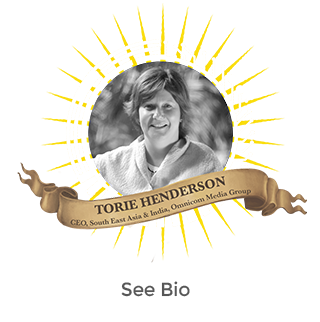 In her role, Torie is responsible for the growth and overall business performance of OMG’s vibrant SEA & India businesses across 7 countries. Prior to her current role, Torie’s most recent focus was on global client leadership where she was at the forefront of helping clients accelerate growth through innovation and adoption of advanced communication strategies and solutions. Torie has transformed local agencies, led regional and global business assignments in 5 markets and in Asia Pacific and the UK in her two-decade long career. She has been awarded by industry. 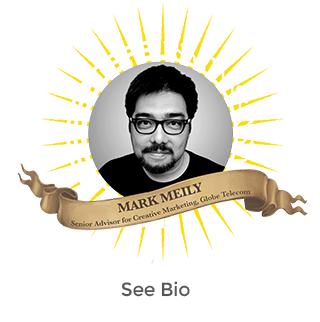 Mark Meily is an award winning independent filmmaker and producer. He studied film at the Ecole Supérieure d’Etudes Cinématographiques (ESEC) in Paris as a French Government Scholar. His work has been shown in different film festivals all over the world and received positive reviews from the New York Times, The LA Times and The Village Voice. His work has also received multiple awards in the field of advertising, film, and television including a Silver Lotus for the Asian Advertising Awards, Best Comedy Award at the Asian Television awards. 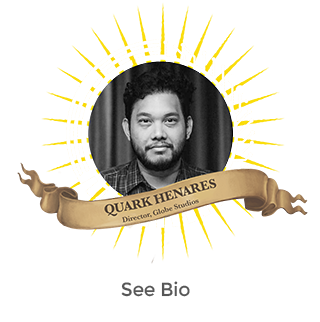 He has taught different subjects in the field of filmmaking, content marketing, and design thinking at the De La Salle University and at the Asian Institute for Broadcast Development in Malaysia. He was the former chair of the film program at the De La Salle-College of Saint Benilde. He consults for Pixar, Fox Channels, FICO, Adept Robotics and the Enchant, an accelerator and seed funding company focusing on IoT development. He recently finished his Master’s Program at Hyper Island in Singapore. He is the co-founder of KindMind, an experience design lab in Manila that helps organizations apply Design Thinking, Circular Economy, and Internet of Things principles in running businesses. 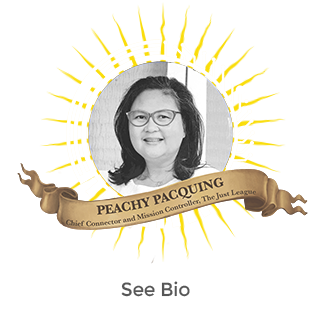 25 years in the marketing communications industry saw Peachy Pacquing assume a multitude of roles, beginning her career as a copywriter to become a multi-disciplinary, multi-awarded local, regional and global creative director. 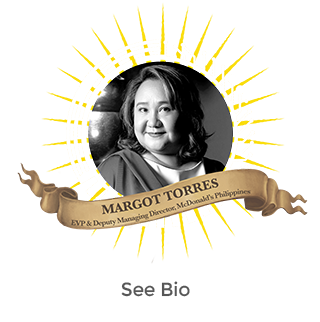 She then assumed the role of an integrated cross-discipline strategist, and acquired business management skills while leading the largest agency discipline as Managing Director for Advertising, eventually retiring as Ogilvy & Mather Philippines' Chief Executive Officer. She shifted her focus from increasing brands' market share and company margins to investing time and talent in the Philippines' human capital. Peachy stood as Executive Director of the twenty Five-year old Virlaine Foundation, and was a Senior Industry Fellow for the ultimedia Program of the School of Design and Arts at the De La Salle University College of St. Benilde. She obtained her Bachelor of Fine Arts from the University of the Philippines, and is on her 7th year as Senior Lecturer teaching Visual-Verbal Communications at UPCFA. She is currently writing her thesis to complete her a MA in Digital Management at Hyper Island Singapore. is a multi-awarded filmmaker known for having written and directed feature films suchas My Candidate, Rakenrol and Keka. He also created the cult TV series Rakista forTV5 and has helmed music videos for everyone from Gary V. to Sandwich to Taken by Cars. When he isn't filming he's also a musician, columnist, DJ, entrepreneur and professor at the Ateneo de Manila University. He is currently the head of Globe Studios, the film and television arm of Globe Telecom. 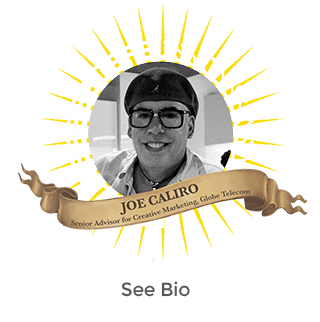 Joe Caliro has spent more than 20 years in producing and developing TV shows, theater, films, and night club entertainment. He has turned around the Customer Service Experience for several large brands such as GTE, Verizon, AOL, E-Telecare, and now Globe Telecom. His blend of Entertainment and Business background has allowed companies to break the barrier of tradition corporate-think to implement change that is world class. 30 years of Marketing experience. 14 years with McDonald's Philippines. She is now the Executive Vice President and Deputy Managing Director who leads the Customer Experience Group which includes Strategy&Insights, Marketing, IT and Operations. Recognized as a Brand Ambassador by McDonald's Asia Pacific Middle East Africa (APMEA) Women's Leadership Network in 2010. Served as Professor in Worldwide Hamburger Marketing University since 2013. Thought leader in the Philippine Advertising industry. President of PANA in 2010 and 2012 and IMMAP in 2017. Awardee of the Agora Award for Excellence in Marketing Management by the Philippine Marketing Association last 2010. 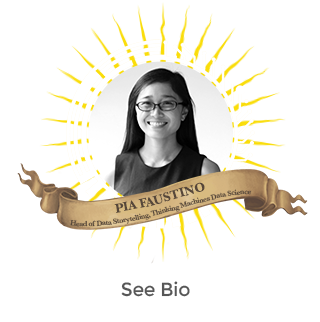 Recipient of the 1st Chief Marketing and Communications Officer of the Year Award by Tambuli from the University of Asia & the Pacific last 2011 and the 1st Market Masters award on mentorship last July 2015. RAOUL PANES is a Business Management graduate of Ateneo de Manila. His fascination with marketing and literature during college found its sweet spot in advertising where he has built a career in copywriting. He has been CD at J. Walter Thompson and Publicis JimenezBasic, then ECD at BBDO Guerrero Ortega. 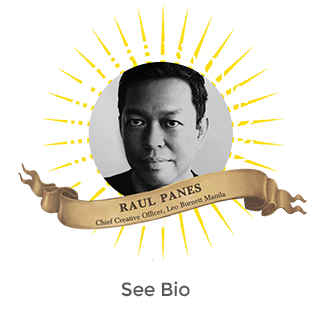 He is concurrently Chief Creative Officer of Leo Burnett Group Manila and Publicis One Philippines. His work has been awarded at Cannes, One Show, D&AD, Adfest, Spikes, New York Festivals, London International and Clio. Under his watch, Leo Burnett Manila has been consistently awarded for creative effectiveness with recognition from AME Awards New York, Warc 100 Rankings and the Festival of Media. He is a Hall of Famer and former President of the 4A’s Creative Guild of the Philippines. When he’s not pounding the keyboard, he pounds the pavement on long runs. 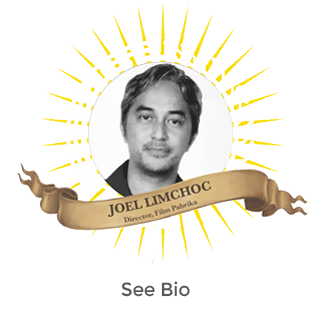 Both as a director and an agency creative, Joel Limchoc has won advertising honors from the Kidlat and Araw Awards, as well as Asia Pacific Adfest, Spikes, London International Advertising Awards, CLIO, D&AD, One Show and Cannes. Presently an in-house director and partner at Film Pabrika, Joel moved to the production side in 2012 after three years in the post of Executive Creative Director of BBDO Guerrero. He is the youngest inductee to the Creative Guild Hall of Fame. From 2007-2010, he was ranked in the Top 10 of the Philippines Hottest Creatives by Campaign Brief Asia and in the Top 100 of Asia's Best Creatives by Media Magazine. He was named Director of the Year for 2010, 2012 and 2013 by Adobo Magazine. A consistent award shows winner, he has worked on numerous multi-awarded campaigns and advertisements with McDonalds. She is charged with the mission of provoking, creating and co-creating the best possible advertising for brands on Facebook and Instagram. Awarded as a writer, art director, creative director and director, Juhi’s work has been recognized at Cannes, Spikes, Adfest, Creative Circle Awards, Citra Pariwara, AD STARS, Adoi Awards, Singapore’s All industry CSR awards, Tambuli Awards, One Show, London International Awards, and 2015 and 2017 Facebook Awards. Awarded as a writer, art director, creative director and director, Juhi’s work has been recognized at Cannes, Spikes, Adfest, Creative Circle Awards, Citra Pariwara, AD STARS, Adoi Awards, Singapore’s All industry CSR awards, Tambuli Awards, One Show, London International Awards, and 2015 and 2017 Facebook Awards. 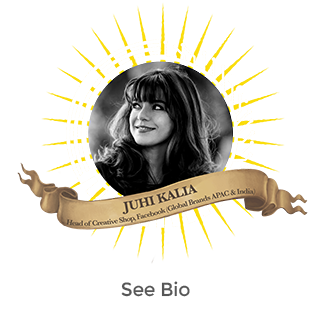 Before Facebook, Juhi’s career in advertising spanned over19 years in JWT, Saatchi & Saatchi, Ogilvy, McCann and Lowe. She has led teams, agencies and global businesses in Singapore, India and Indonesia. And led creative development for markets like Brazil, China, Russia, U.S, East Europe, Middle East, Australia, Africa and South East Asia. Under her leadership JWT Indonesia won a multitude of international awards including the first Cannes Lion for the country ever. Andy Wilson has lived and worked in Asia for seventeen years. He is the Head of Strategy for BBDO and Proximity Asia, leading planners across the region and developing innovative and effective communications strategies. Under his leadership BBDO has been the most effective network in Asia-Pacific for the last 5 years. Andy runs the strategy department for BBDO across Asia, which includes +100 planners across 12 offices, and is ultimately responsible for the quality of the strategic thinking and effectiveness of our campaigns. He leads strategic planning for some of BBDO’s largest clients in the region, including Mars & AIA. Prior to joining BBDO twelve years ago, Andy worked at Ogilvy for six years, in Jakarta, Tokyo and Singapore. Before Andy moved to Asia he worked for a number of brand consultancy and research houses in London during the 1990’s. 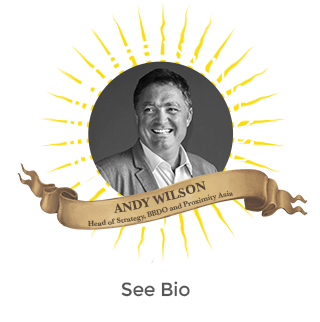 Andy is a graduate of Oxford University where he studied philosophy, psychology, and anthropology. 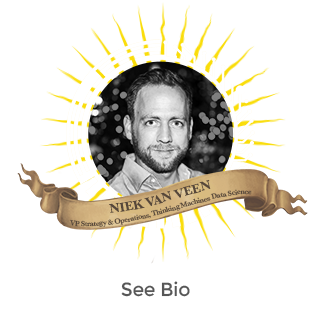 Niek van Veen is VP Strategy & Operations of Thinking Machines Data Science, a data science consultancy. Thinking Machines' work combines algorithmic thinking and data storytelling to drive effective action in organizations and communities. Their work includes machine learning for consumer segmentation for Meralco, analytics solutions for Ayala Corp, and big data ingestion for Waze. Before joining Thinking Machines, Niek has been a successful Marketing and Digital Transformation leader with 15 years experience across Asia Pacific and Europe. © 2019 Adobo Festival of Ideas.